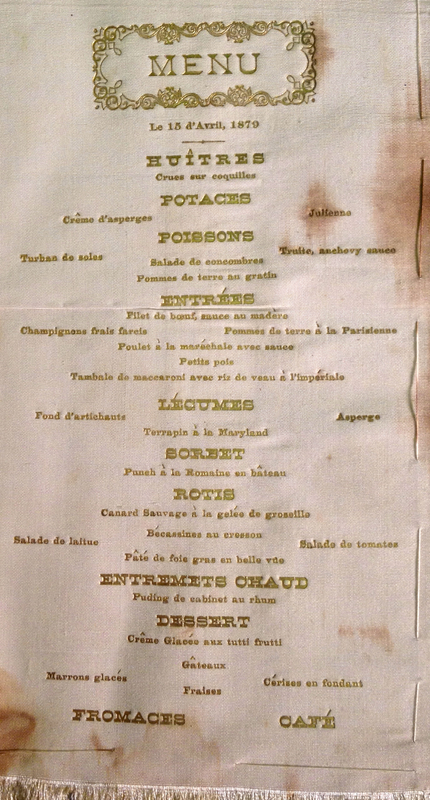 Society-hostess Jane Poultney Bigelow, wife of the former Ambassador to Paris, followed the example of trend-setting restaurant Delmonico’s when she presented guests to her 1879 ball with a silken menu, embossed with gold lettering. What could be more Gilded Age? Published: July 28, 2013 Dimensions: 1471 × 2739 Posted in: Archives Gallery Post a comment or leave a trackback: Trackback URL. Can you recommend a good Bigelow resource. With the exception of the website at Union College, I can’t seem to find one that is well curated. I recommend reading his multi-volume autobiography. I think it’s all available on archive.org.